Posted on Tue, Mar 6, 2012 : 1:14 p.m. Eight road projects, including four that could be completed in cooperation with Ypsilanti Township, are among the road construction projects that will be discussed Wednesday morning between Augusta Township officials and representatives from the Washtenaw County Road Commission. 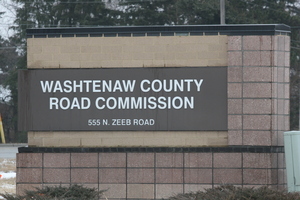 The meeting will take place at 9 a.m. at the Washtenaw County Road Commission offices, 555 N. Zeeb Road. The township will have $1,346 more n local road matching funds than in 2011 and the same amount of drainage matching funds of $14,554. In 2011, the township spent about $97,000 on road work that included the addition of limestone on Tuttle Hill Road from Judd to Talladay roads and Talladay Road from Hitchingham to Whittaker. Ditching work was performed on McKean Road from Bemis to Willis roads. Bemis Road from Stoney Creek to Hitchingham roads - ditching, berm removal, surface work and the addition of about 3,300 tons of limestone at an estimated total cost of $98,000 with the township’s portion estimated at $49,000. Bemis Road from Whittaker to Tuttle Hill roads - ditching, berm removal, work on the road surface to include about 2,850 tons of limestone at an estimated total cost of $76,500 with the township’s share estimated at $38,250. Bemis Road from Tuttle Hill to Bunton roads - ditching, berm removal, shaping the surface and the addition of about 2,850 tons of limestone at an estimated total cost of $80,000 with the township’s portion estimated at $40,000. Bemis Road from Bunton to Rawsonville roads - Ditching, berm removal and work on the road surface to include about 2,850 tons of limestone at an estimated total cost of $76,500, with the township’s share an estimated cost of $38,250. Bunton Road from Willow to Liss roads - The addition of about 5,100 tons of limestone and berm removal at an estimated cost of $64,000. McKean Road from Bemis to Willis roads - The addition of about 4,350 tons of limestone and road shaping at an estimated cost of $49,000. Judd Road from Bunton to Tuttlehill roads - Ditching and tree removal at an estimated cost of $42,000. Stoneham Estates Subdivision - Crack sealing of five roads at an estimated cost of $17,800. Augusta Township has 50.73 miles of certified gravel roads and last year township officials decided to have two solid applications of dust control to all of them. One application costs about $18,600. Tue, Mar 6, 2012 : 8:23 p.m.
how about we pave some gravel roads.